If fully installed, the game does not require the CD to play. This game is not available digitally. Evergreen has gone on record saying it likely will never have one, due to rights issues regarding retired pro players. 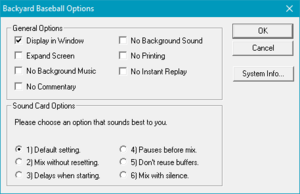 General and sound card options, accessed from pressing Space and selecting "Options...". Game options. The interface around the Options "tab" can change depending on what the player selected. Press Space, select "Options...", then check "Display in Window", then click OK.
On modern operating systems, game launches and adjusts the display to 640x480, with the game running at fullscreen. It does not save the "Display in Window" option. Required to navigate the menus. 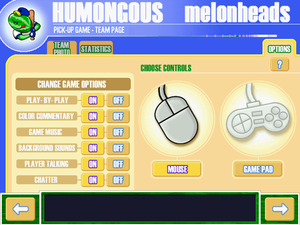 It is possible to move the cursor and select using a controller, but only when the Gamepad option is selected from the Single Game or Season Play modes. Even then, you can't use it outside of those modes, such as in the Club House (main menu). 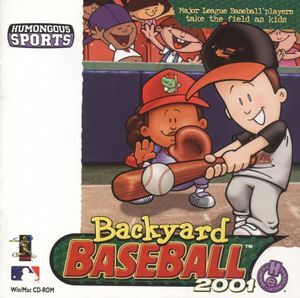 Game previously offered online play through Humongous Sports Network, but the servers have long since shut down.